Double LP version. 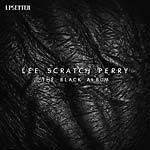 At 83 years of age, Lee Scratch Perry presents to the world his next full-length solo album, The Black Album, with dub versions, continuing his inimitable roots reggae legacy. Lee's brief for the album, was to blend the vintage and the obscure, during the sessions Lee referred to the sound and "black" and wanted space, light and darkness in the songs and their respective dub versions. The result sees Lee having mixed up an analog concoction of ultra-rare effects, sonic wizardry and deep heavy roots rhythms. Over 2017 and 2018, Lee Scratch Perry reunited with producer and mixer Daniel Boyle to start work on their second solo album project for Lee. Picking up where their last efforts Back On The Controls (2014) left off. Lee wanted to continue the raw analog sound they had cultivated together over multiple past releases, and take it to the next level with new effects devices to create another sonic signature. They entered the studio in 2017, to begin to put together ideas for the tracks, which were then taken to RAK studios in London with their ever-changing Rolling Lion All Stars session band; to lay down the rhythm versions. Using strictly vintage analog equipment, they employed Neuman valve and RCA Ribbon microphones, and RAK's early model vintage API desk to record, the "sound" for the album was sculpted in these sessions. Vintage, but punchy, which was then blended with Lee's choice of super rare and custom analogue effects. Ursa Major Space Station and Stargate delays and reverbs, old choruses, plate and spring reverbs, and tape delays were used to create a tight vintage feel but retaining the rawness of the "Low Fi" roots sound Lee was aiming for. With the music coming together, the vocal sessions were held in Abbey Road Studio 3, again using vintage RCA ribbon mics, overdriving their EMI TG console and Fairchild compressors to create a pleasantly distorted lo-fi vocal sound. Lee and Daniel then returned to Daniels Rolling Lion Studio, to mix and dub the album, live, on the mixing console. At 83 years of age, Lee Scratch Perry presents to the world his next full-length solo album, The Black Album, with dub versions, continuing his inimitable roots reggae legacy. Lee's brief for the album, was to blend the vintage and the obscure, during the sessions Lee referred to the sound and "black" and wanted space, light and darkness in the songs and their respective dub versions. The result sees Lee having mixed up an analog concoction of ultra-rare effects, sonic wizardry and deep heavy roots rhythms. Over 2017 and 2018, Lee Scratch Perry reunited with producer and mixer Daniel Boyle to start work on their second solo album project for Lee. Picking up where their last efforts Back On The Controls (2014) left off. Lee wanted to continue the raw analog sound they had cultivated together over multiple past releases, and take it to the next level with new effects devices to create another sonic signature. They entered the studio in 2017, to begin to put together ideas for the tracks, which were then taken to RAK studios in London with their ever-changing Rolling Lion All Stars session band; to lay down the rhythm versions. Using strictly vintage analog equipment, they employed Neuman valve and RCA Ribbon microphones, and RAK's early model vintage API desk to record, the "sound" for the album was sculpted in these sessions. Vintage, but punchy, which was then blended with Lee's choice of super rare and custom analogue effects. Ursa Major Space Station and Stargate delays and reverbs, old choruses, plate and spring reverbs, and tape delays were used to create a tight vintage feel but retaining the rawness of the "Low Fi" roots sound Lee was aiming for. With the music coming together, the vocal sessions were held in Abbey Road Studio 3, again using vintage RCA ribbon mics, overdriving their EMI TG console and Fairchild compressors to create a pleasantly distorted lo-fi vocal sound. Lee and Daniel then returned to Daniels Rolling Lion Studio, to mix and dub the album, live, on the mixing console.